A tulip is a bulbous plant in the genus Tulipa, in the family Liliaceae. Most cultivars of tulip are derived from Tulipa gesneriana. 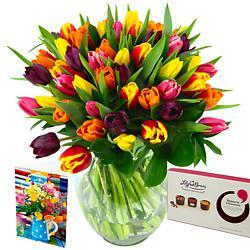 Vibrant tulips are one of the most popular flowers in the world. They were originally brought to Turkey by the nomadic tribes in the late 16th century. Tulips are the third most popular flower in the world, next only to Roses and chrysanthemums. The Tulip is the national flower of Turkey. Tulip flowers are considered to be a symbol of perfect romance; depicting their passion, love, romanticism and dreaminess.